HMH Books for Young Readers, 9780547807980, 208pp. Whether she likes it or not, ten-year-old Piper Lee DeLuna is about to get a new family. Four years after the plane Piper's daddy was piloting disappeared, her mama is remarrying. The way Piper sees it, Mama's being plain disloyal. Besides, who'd want to get stuck with a prison guard for a stepdad and that weenie, Ginger, for a stepsister? But when Piper Lee hatches a foolproof plan to get the wedding called off, it quickly spirals out of control. And by the time Piper realizes what she’s done—and just how much she really cares about her new family—it might be too late. 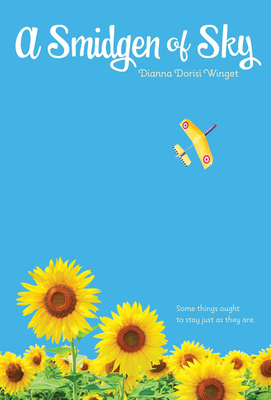 Told in Piper Lee's irresistible Southern voice, A Smidgen of Sky is about new families and new beginnings. "This sweet story has an old-fashioned feel." "Winget's poignantly flawed characters and honest emotional circumstances draw readers into a story that feels like its set in a simpler time and place."